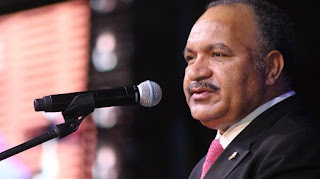 The Papua New Guinea Government has promised that the foreign exchange shortage problem will soon be addressed following negotiations with the World Bank and the Asian Development Bank. The Bank of Papua New Guinea is also to lift its foreign exchange market intervention to K300 million ($US100m), according to Treasurer Charles Abel, who tabled the 2017 Supplementary Budget in Parliament Wednesday. O’Neill said the daily demands for foreign exchange in the country were being met through interventions by the Central Bank. “It is the extraordinary payments like dividends in large amounts which is causing stress in the availability of foreign exchange,” he said. “Some big firms with foreign operations are using profitability from PNG to fund their businesses overseas. That is also affecting our foreign exchange . O’Neill said the Government had brought onshore revenue from the country’s exports to meet the demand for foreign exchange. East Sepik Governor Allan Bird raised the foreign exchange shortage problem in Parliament because of the adverse impact on businesses. O’Neill, however, said some firms park their revenue offshore despite the number of exports. “Foreign exchange shortage is a monetary matter managed by the Central Bank — not Treasury or Government.”.